The main features of BiVisu are detection and visualization of biclusters embedded in a gene expression data. 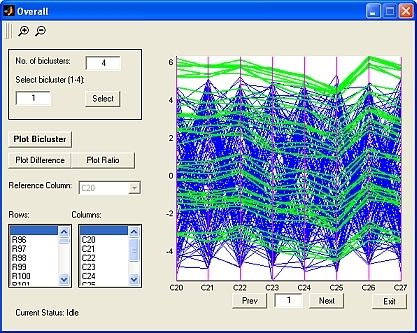 The GUI of BiVisu is illustrated in Fig.1. BiVisu accepts the expression data contained in a text file. To demonstrate the use of BiVisu for additive models, we select one of the artificial data implanted with additive-related biclusters provided in our web page. Detection of additive-related biclusters can be performed by selecting "Additive Model" in the "Run" menu. Fig.2 shows the display of BiVisu after biclusters detection. 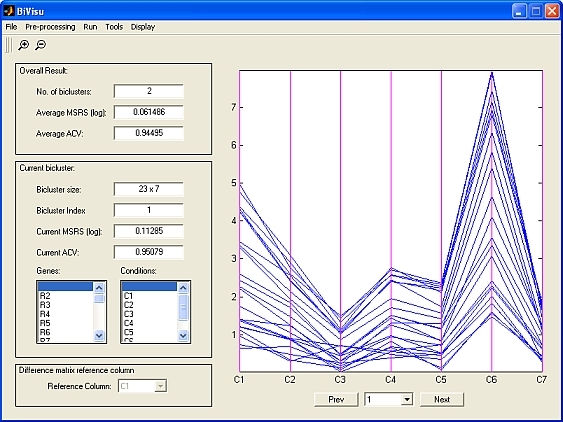 By default, the right side of the figure displays the PC plot of gene expression values at different conditions in a currently selected bicluster. This shows an additive-related bicluster. The left side of the figure shows useful information regarding the biclustering results. In particular, the mean square residue score (MSRS) and average correction value (ACV) are provided for objective evaluation of the bicluster homogeneity. 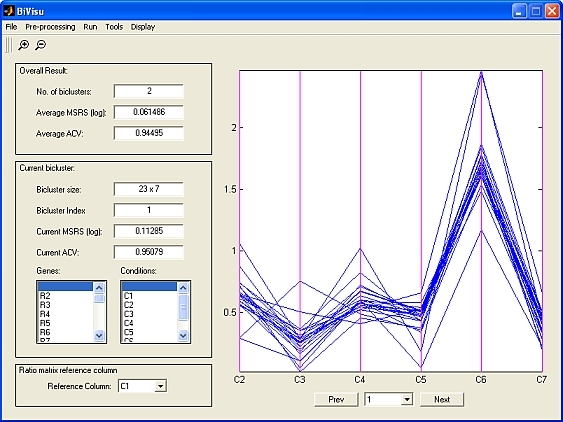 This objective evaluation is complement to the subjective evaluation of PC plots. The labels of genes and conditions are shown in text boxes if information of genes and conditions are provided in the input data. By selecting the gene labels in the text box, their representation can be highlighted as demonstrated in Fig. 3. BiVisu also provides easy access of each bicluster using "previous" and "next" buttons or a drop-down menu for bicluster selection under the figure. Fig.3. A single / a set of gene(s) can be highlighted by selecting its/their labels in the text box. In addition, BiVisu provides another insight of biclusters visualization through PC plots of difference matrices, which shows element-wise differences between a selected column (reference column) and other columns. The PC plot of the difference matrix is able to visualize coherence of genes because expression values in an additive model changes in similar amounts over the experimental conditions as seen in Fig.4. In the biclustering algorithm, the coherence of detected bicluster can be controlled through the parameter noise threshold. A small noise threshold means a high biclusters homogeneity is enforced. Fig.5 shows a bicluster detected using smaller value of noise threshold. 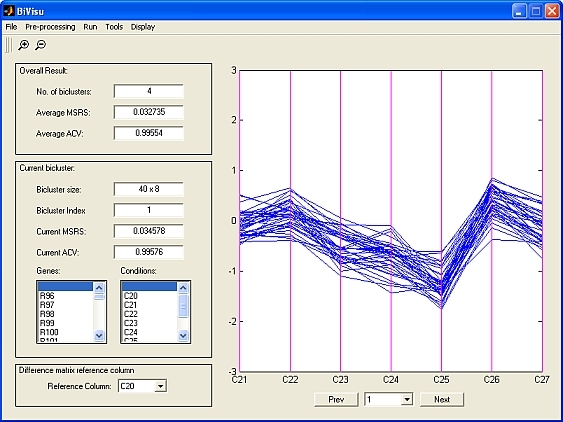 As seen, lines are closer to each other in the PC plots with a small noise threshold. However, it should be noted that a small value may miss part of "meaningful" biclusters. Selection of the appropriate noise threshold can be done by evaluating the PC plots of difference matrices. Fig.5. The PC plot of a difference matrix of a detected bicluster with smaller noise threshold. Another useful tool in BiVisu is that a separate window can be invoked to compare gene expression values inside and outside of the detected biclusters. A snapshot of the separate window is given in Fig.6. Fig.6. A separte window displays expression values of genes in a bicluster and other genes under the conditions in the bicluster. Apart from additive models, BiVisu can detect multiplicative-related biclusters. One of the main advantages of BiVisu for multiplicative models is that the data are not limited to positive values. The input data can be any positive and negative values other than zero. To demonstrate the use of BiVisu for multiplicative models, we select one of the artificial data implanted with multiplicative-related biclusters provided in our web page. In BiVisu, our proposed algorithm for detecting multiplicative biclusters can be applied by selecting "Run" -> "Multiplicative Model". The results of detection are displayed as shown in Fig.7. 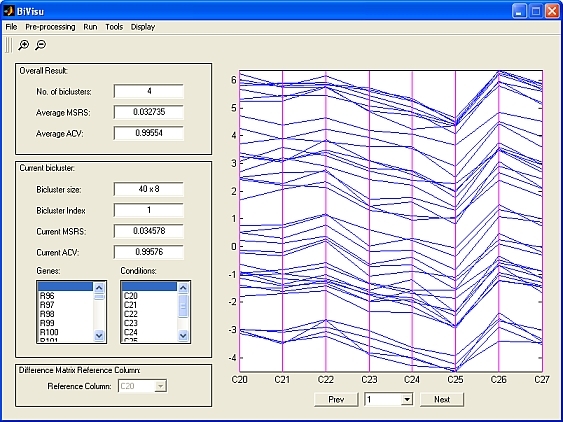 Instead of difference matrices, ratio matrices can be selected for display for homogeneity analysis. An objective measure of homogeneity, MSRS on log values, is provided for positive data. However, another provided measure ACV is more flexible because it works for values other than positive values. Fig.7. Results for an artificial data embedded with multiplicative-related biclusters (a) with PC plots of expression values and (b) with PC plots of ratio matrices. 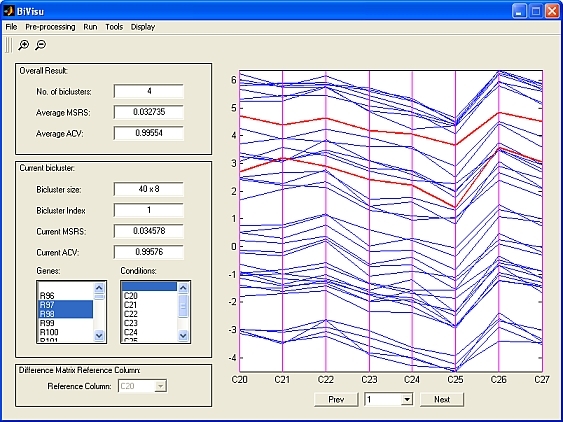 To facilitate the analysis, zoom in and zoom out functions of PC plots are provided in the tool bar as indicated in Fig. 8. Besides, functionalities such as pre-processing, bicluster selection and heat map display are also provided. They are accessible from the menu bar as shown in Fig.9. In particular, a separate window as shown in Fig.10. is generated for the heat map display. Fig.8. 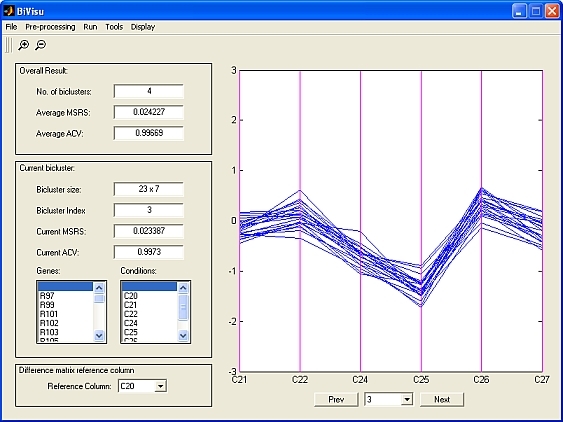 Zoom in and zoom out functions for PC plots are provided in the tool bar. Fig.9. 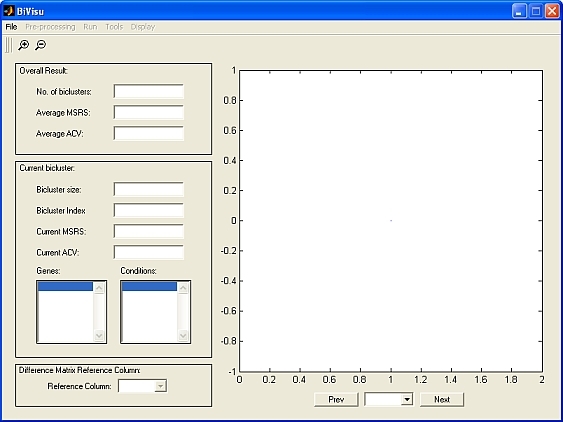 Functionalities that can be accessed from Menu bar: (a) import and export data, (b) preprocessing, (c) biclustering model selection, (d) filtering, (e) PC plot selection and (f) separate display of all genes over the conditions in a currently selected bicluster, a heat map and configuration information. Fig.10. 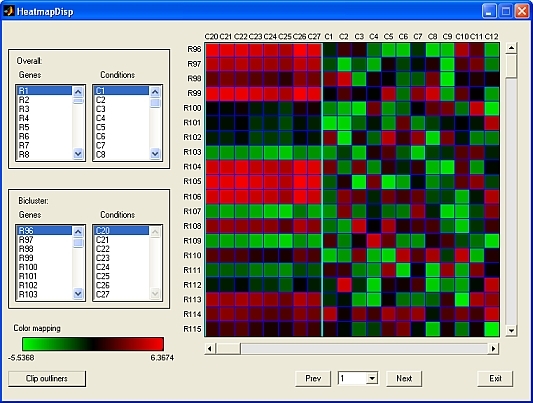 An example of heat map display.